The Ecstasy and Agony of Civil Rights in the U.S.: Rosa Parks and the Voting Rights Act Challenge! 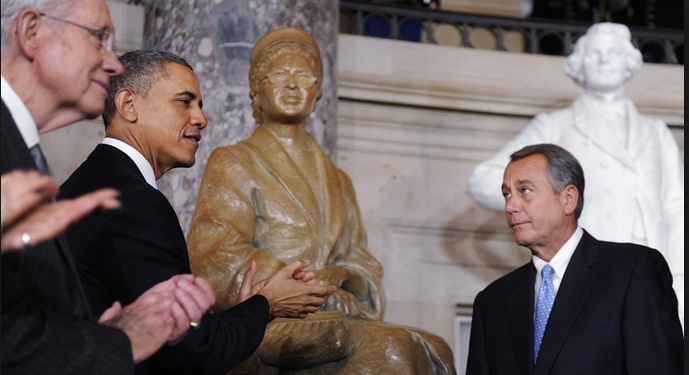 Parks became the first black woman to be depicted in a full-length statue in the Capitol’s Statuary Hall. A bust of another black woman, abolitionist Sojourner Truth, sits in the Capitol Visitors Center. “Section 5 of the Voting Rights Act requires nine states (seven of them in the South) and parts of seven others with records of extreme discrimination against minority voters to get approval from the Justice Department or a special court in Washington before they can make any changes in how they hold elections. Without this provision, there would be no way to prevent new and devious efforts by local officials to block blacks and Hispanics from voting or to reduce their electoral power. In 2006, Congress overwhelmingly reauthorized the statute. It found that these places should remain “covered” by this “preclearance” requirement because voting discrimination remained both tangible and more concentrated and persistent in them than in other parts of the country. House members from those places strongly supported the renewal: of 110 members from covered jurisdictions, 90 voted for reauthorization. We lurch back and forth on racial issues in this country. At times we can be very proud of what we do and at other times shake our heads and wonder. that Hannity was violating “every journalistic ethic” in the book. 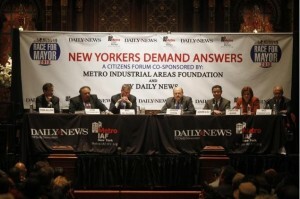 New York City Mayoral Candidates Debate Education at Town-Hall Forum!! Quinn: We should explore a teacher mentor system. Mentioned CUNY as willing to set up an institute to establish such a system. Lhota: Adopt a merit pay system similar to Newark and we should stop vilifying teachers. deBlasio: Student performance should be part of evaluation but keep in mind that most teachers are in the public schools for the right reasons. There has been a corrosive effect on their morale due to standardized testing and a curriculum based on test preparation. Thompson: Parents and peers should be part of the evaluation system. Allon: Supports small schools and choice but a major problem has been a lack of support for principals. He also called for more instructional leadership and singled out the NYC Leadership Academy as having undermined teaching and learning. Thompson: Options are necessary but there is a need to involve the people in the community. Quinn: The present system sees the closure of a public school as an accomplishment when it should see it as a failure on its part to correct problems. Several of the other candidates made a similar comment. Catsimatidis: Sometimes you have to shake things up. deBlasio: Would raise taxes on all residents making in excess of $500,000 to set up a special school fund. He would use the increased revenue to fund universal, all-day pre-k and after hours programs for middle schools. 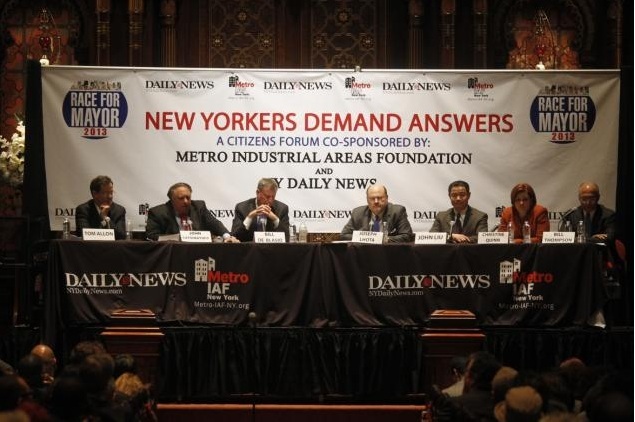 Allon: Raising taxes on the wealthy will drive them out of the City. Look at contracts and private service providers. Pearson is making “a mint” on public education. Lhota: As a CUNY trustee for twelve years, he has seen that most NYC high school graduates are not ready for college. In the past year, 81% of the applicants to CUNY who graduated from NYC public schools were not ready and needed remediation. Liu: We need to increase the number of college graduates among NYC residents. He would set a goal of increasing the percentage of college graduates in the City to 60% by 2025. In sum, I thought it was a very important event for public education in New York City and that the candidates had done their homework. 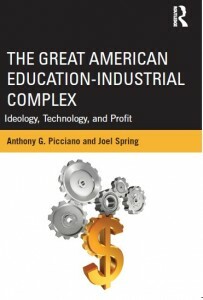 Book: The Great Education-Industrial Complex: Ideology, Technology, and Profit! 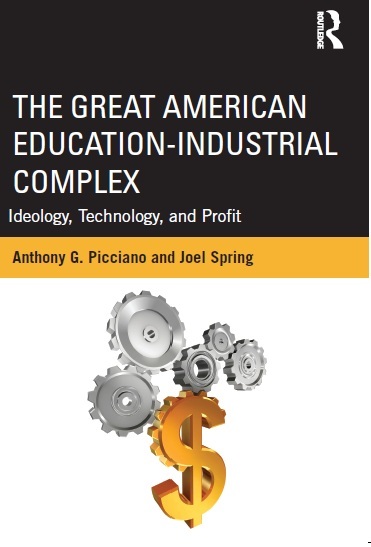 It contains a number of case studies that document major education service companies, corporate-sponsored foundations, for-profit colleges and others that engage in questionable practices in an effort to secure policies beneficial to their goals much of which in recent years centers on the promulgation of technology. Joel and I bring very different perspectives to these issues. And at two hundred pages, it is a quick read. New Pro-Obama PAC: $500,000. Gets You Access to the President! The White House is pushing back on suggestions that it is participating in a pay-for-access scheme, in which big-dollar donors to a pro-Obama PAC get a quarterly audience with the president. Over the weekend, The New York Times reported that the newly formed Organizing For Action, a so-called social welfare group, would set up four meetings a year with Obama for individuals who gave more than $500,000. The funding setup was designed to give the new group the capital it needs to begin its advocacy efforts, which consist primarily of helping advance the administration’s agenda. Ethically, however, it has raised questions for providing a gateway to big-money interests essentially to purchase a seat near the president. Obama has in the past decried this very type of culture as one of Washington’s major ills. “That’s one of the reasons I ran for president,” Obama said on May 2, 2012. This is a highly questionable practice that just does not look right! Michael Tomasky: Republican Party Has Become a Machine of Rage, Hate, and Resentment! “God knows, policy positions are a problem. But they are not the problem. The problem is that the party is fanatical—a machine of rage, hate, and resentment. People are free to scoff and pretend it isn’t so, but I don’t think honest people can deny that we’ve never seen anything like this in the modern history of our country. There’s a symbiosis of malevolence between the extreme parts of the GOP base and Washington lawmakers, and it is destroying the Republican Party. That’s fine with me, although I am constantly mystified as to why it’s all right with the people I’m talking about. But it’s also destroying the country and our democratic institutions and processes, which is not fine with me. Union Membership Fell by 2.7 Percent or More than 400,000 in 2012! Education Secretary Arne Duncan visits New York Harbor School on Governors Island, praises ‘visionary’ institution! The Daily News had an article yesterday describing the visit of Arne Duncan, along with Schools Chancellor Dennis Walcott and teachers union boss Michael Mulgrew, to the New York Harbor School, which houses 400 students and prepares them for careers in marine biology and robotics. Duncan spoke highly of the campus and the kids, saying that if more schools like this existed, “think of what our graduation rate would be.” Duncan’s visit comes after Obama praised P-TECH (Pathways in Technology Early College High School) in Brooklyn during his State of the Union speech a couple of weeks ago. The Harbor School, located on Governors Island, is indeed one of the jewels in the New York City public education system. One of my former students, Nathan Dudley, who graduated from Hunter College’s Administration and Supervision Program, was the founding principal and visionary for the school. He left his post this past summer to work at the central office. P-Tech is a joint project of the NYC Department of Education, CUNY and IBM. Those of us involved in K-12 education in whatever capacity see the positive stories of the Harbor School and P-Tech over and over again and wish there were more of them in New York and cities around the country. Unfortunately we also see high schools in the poorest areas of the city that were developed in some cases in great haste that do not have any science laboratories so that students in these schools will never have the opportunity to take a hands-on science course. Regardless we are glad that we are getting it right for some of our students. We need to work harder to get it right for all of them. New Stanford University CREDO Study on New York City’s Charter Schools! “From a national standpoint, the 20-year-old charter school movement has been a disappointment. More than a third of these independently run, publicly funded schools are actually worse than the traditional public schools they were meant to replace. Abysmal charter schools remain open for years, even though the original deal was that they would be shut down when they failed to perform. New York City’s experience, however, continues to be an exception. For the second time in three years, a rigorous study by Stanford University’s Center for Research on Education Outcomes shows that the typical New York City charter school student learns more in a year in reading and math than his or her peers in their neighborhood district schools. The difference, over a typical year, amounts to about a month’s more learning in reading — and a whopping five months’ more learning in math. That is good news, especially given the fact that about three-quarters of the city’s charter school children come from poor families. But a mixed picture emerged when the Stanford researchers measured charter schools on students’ learning growth (year-to-year improvement) as well as their overall achievement, as compared with the city as whole. The data show that not all charter schools shared equally in the gains in reading. Nearly half, in fact, turned out to be slow-growth schools that may not be helping low-achieving students improve their reading skills quickly enough. This could lead to those students falling further and further behind. Below is a table from the report comparing the demographics of traditional public schools (TPS), Feeder Schools and Charter Schools in the study. I would offer that either because of the admissions selection criteria or the push-out policies that some charter schools in New York City engage in cherry-picketing the students they want in their schools. New Book: The Idea of the Digital University…the Battle for the Soul of Higher Education! I just finished a book entitled, The Idea of the Digital University: Ancient Traditions, Disruptive Technologies, and the Battle for the Soul of Higher Education, by Frank McCluskey and Melanie Winter. Both authors have had extensive experience in non-profit and for-profit private higher education. Frank is a colleague of mine who has done a good deal of work in online learning. While retired now, his last position was as provost at the American Public University System. Melanie’s expertise is as an administrator dealing with digital records. In sum, this was well worth the read and a good addition to the literature that attempts to decipher where higher education is going as a result of the rapid expansion of digital instruction.